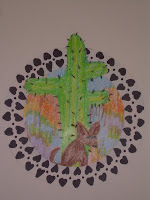 Well, here is a little cactus mandala-ish type thing I came up with the other night. I used regular ol' kids Crayola Crayons! 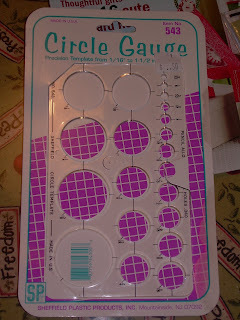 Then the outer ring with a Sharpie...it is a cut-up, peiced together thing, and I quite enjoyed it. I think I am more of a collage person, I like peicing things together. It is liberating to realize this! Hey...I'm free now...I can collage away!!! Oh, happy day!!! Hope you all are enjoying your week, and will have a lovely Friday. 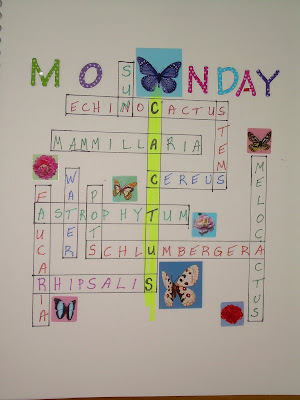 I hope to have a new collage for you for Cactus Monday next week. 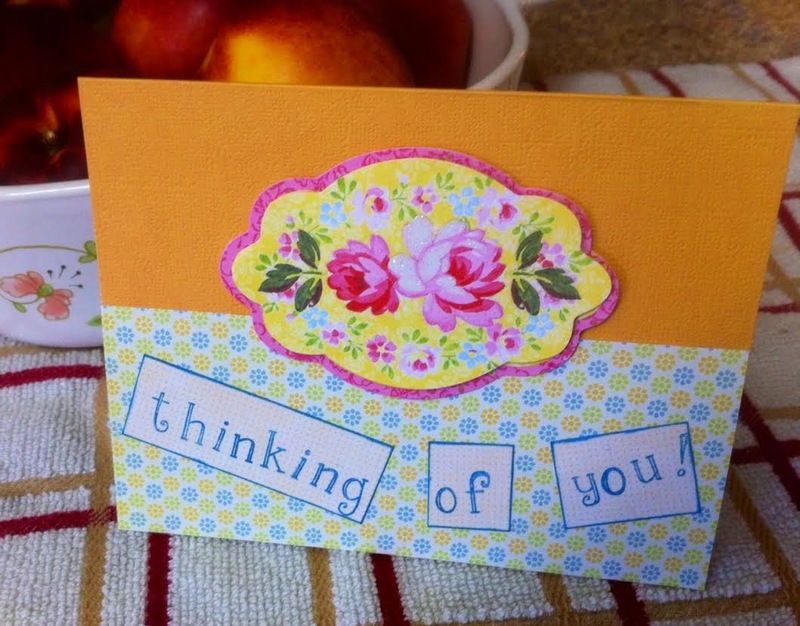 I just want to send out love and positive thoughts to Marianne and Vickie who lost someone dear to them yesterday. My thoughts and prayers are with you both. I went out to take pics of my tire gardens tonight and this tire-ful sure looks sad. I would say all my tires need a little bit of fixin up...but this one in particular. It is hard to see in the photo, but they are all turning a reddish color...I hope from the winter light, and not some weird malady. 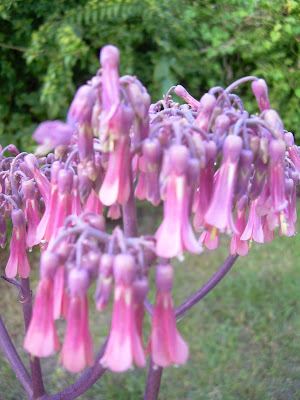 Here are some of the mauvy purple blooms hanging down from long stalks put up by my Mother of Millions plant (kalenchoe daigremontianum). The bottom pic is what the plant looks like below the stalks, and I think it is particularly beautiful when it has the pink hues in the leaves...they can range from green, green-blue, and pinky purple in color, and are a lot of fun to watch year round. 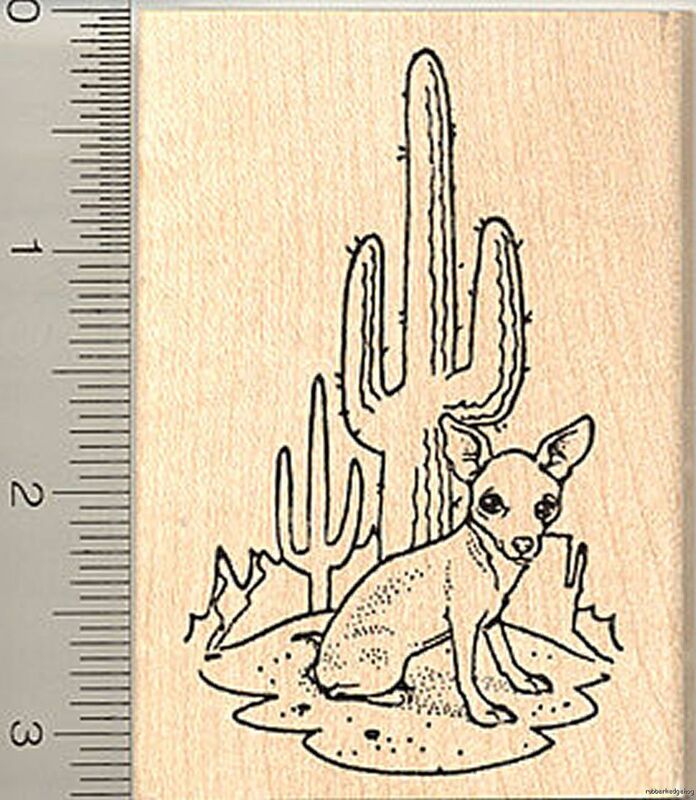 I found Doozey by a saguaro on a stamp! I think I need this...but it is 11 dollars! Lawsy! You can see it HERE, on Ebay, with my name written all over it! If nobody else buys it, I may be forced to do so! LOLOL. Happy Cactus Monday everyone! I haven't posted much lately...not much going on here. I have accomplished more around the house, and had a few doctor appt's...just normal stuff...been busy at work. Just haven't done anything artistic, and not much to show in regard to my succulent plants. Today a friend and I went to the South Florida Fair where we saw some neat stuff. I really enjoyed the Chinese acrobats, the animals from Australia...Wallabys, and Kookabura were neat! I had a delicious banana and Nutella crepe! Saw some people dressed like penguins doing funny dives into a big pool of water, some absolutely gorgeous roosters! We watched pig races, and had a corn dog. I bought some stuff too...4 CD's of absolutely restful and exquisite acoustic guitar music, some Watkins pain relieving spray (which I intend to stray on my legs when I get home in tbe evenings after standing all day), and I am planning to go online to look at these other fun things like stuffed pads that can be heated in the microwave...to cover different parts of the body...all in cute patterned fabrics...I need one for my sore shoulder, which I have somehow strained. Anyway...it was a fun day. Tomorrow is grocery shopping, and hopefully mostly sitting around doing nothing day! LOL. I have to decide on a Cactus Monday idea! What will it be????? One of my fav artists! "The love of learning, the sequestered nooks, and all the sweet serenity of books"! That statement is ME! You can find me sequestered away somewhere with a book, or a laptop..learning all of the time. I hope you will go visit and see if Mary has something free for you also! Doozey finds my hidden cactus! I was out taking a walk around the neighborhood with my Mom when my eye fell on these two corn plants laying out to be picked up by the trash people!!! I had just been looking at them at the store as a possible plant for my screen room! I immediately thought of my new blogger friend over at Plant Rescue, and I knew I must take action! 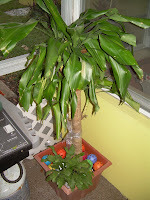 I scooped them up, while Mom carried their pot, and we got them repotted in the pot they had been in, and I trimmed the leaves up and secured them in this larger terracotta colored plastic pot, and used old beer and soda bottles to secure the whole thing...tied them together at the top of the trunks with plastic wrap. I threw in some colored whiffle balls to kinda cover the beer bottle underneath, and voila...it is beautiful. 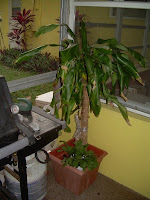 Now I am off to the internet to find how to take care of a Corn Plant. The pic on the left shows the plants (there are two in here, but hard to see) before I trimmed them up, and the one on right are the finished ones...ready for a new chance at life! While sitting around this evening, and when I realized I would be subjected to an hour of COPS on TV, by my DH, I quickly left to find something else to focus on. I was reading my little book called "3,299 mantras, tips, quotes, and koans for peace and serenity", by Barbara Ann Kipfer. I ran across this: "Focus on a sound or image to stop the chatter of your mind. Repeat a mantra, or gaze at a candle flame or mandala"
That was when I started to just draw something out with a pencil, and it ended up being THIS! Just a silly scribble, but I added some glitter shine to it, and just wanted to say that the little ribbons running through are your thoughts, and the SHAWRING is my mantra. I am sure it was spelled differently when I first recieved it from my Maharishi back in high school, when my whole family learned Transcendental Meditation. I have not told anyone my mantra all these years, because I was told not to...but now I figure what difference does it make anyway! So that is the story of how this little quick drawing came to being. 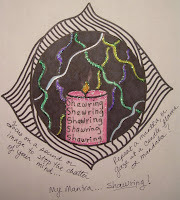 I kind of see it as a mandala of my eye reflecting the candle flame, while repeating my mantra! Oh the things I can think of to entertain myself! ANd then to inflict it upon my poor blog readers...for shame!!! LOL. 1/16, 3/32, 1/8, 5/32, 3/16, 1/4, 5/16, 3/8, 7/16, 1/2, 9/16, 5/8, 11/16, 3/4, 13/16, 7/8, 1", and 5 more sizes up to a 1 and 1/2 inch circle! Hey...what can I say...small things make me very happy! these chairs in my dining room (if I had one)! New succulent plants, and a possible I.D. Well, two exciting things have happened today....(well two that excite me most anyway)!!! First, these two photos were taken just now in hopes that someone out in the succulent expertise world will be able to confirm my suspicion that this plant could possibly be a Plectranthus amboinicus. 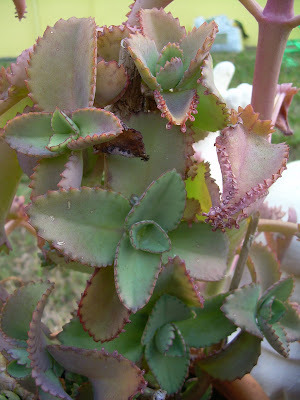 I was looking through my Illustrated Succulent Dictionary and came upon a pic that looks just like this plant (these are cuttings that I took off of a plant that was given to me, and I thought it was a light and water starved Kalenchoe). 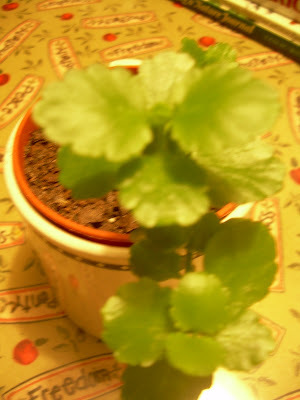 It may still be that, but this photo looks a lot like my plant, and I am sort of thrilled that it could be a sort of rare plant that someone had, and it got passed along to me. Oh Lord...this is another succulent mystery...but they sure are exciting. Now....if anyone can tell me, feel free...I will try not to get my bubble burst too badly!!! LOL. Here is a cute...oh so very cute, little bucket of succulents I just HAD to have today from Home Depot! I bought it for one reason, and one reason only! For the Haworthia of course! LOL. These other two plants are two I do not own, but they don't really do much for me either. I will probably kill them. 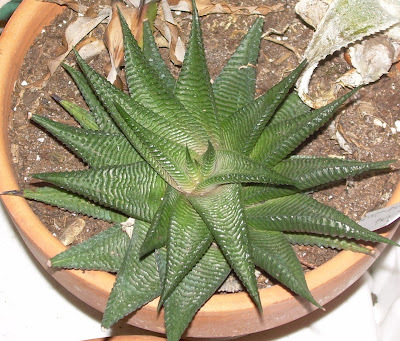 BUT...my Haworthia reinwardtii...STAND BACK...nothing will come between me and my Haworthias! These are particularly interesting...and I got 4 tall ones standing proudly in the back of the bucket! YES!!!!! Oh...and if anyone knows the I.D.s on these other two in the bucket...shout it out! Have a wonderful Friday! Last day of the work week. Oh...if anyone has any really exciting weekend plans, let me know so I can do it also!!! How's everyone doing? It is midweek and all is well. Been busy. I was looking for a good pic to post tonight, and then I got this really cute shot of Doozey which I did a "neon" treatment to, and look what turned out! I think it looks very cool! We went over today and met all the ladies who are hooking together all of the crocheted squares everyone turned in (for WarmUpAmerica.org), and they have a really pretty one started with a lot of pastels...so it was decided that they need quite a few squares made of solid pink to put in between, and this blanket will be for a female veteran! That is cool! So we are all working on that color this month. I cannot do the joining together part because they meet during the workweek, so, we will just keep on making squares! It is satisfying to see them made into something useful and for a good cause! 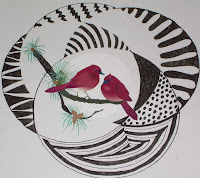 My friend and I are looking for a tole (decorative)painting class to take. We are already intermediate level tole painters (have I ever mentioned that?) 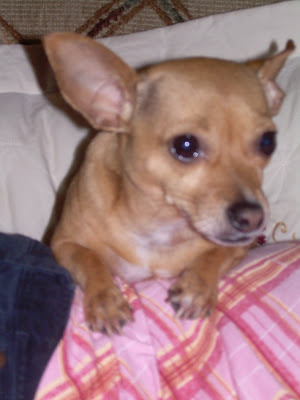 and our old teacher moved away, so we need of a new one...maybe I will have luck tonight when I search around online. We tried Community Education, and there is not a class near enough, so I will check a few of the local towns to see if their recreation centers offer it. 2 more days of work. I am looking ahead to a nice weekend. Maybe I will go and take pics of all my stuff I tole painted and show it...that could be fun! Here is a lovely mandala made by nature! One of my Haworthia Limifolias! 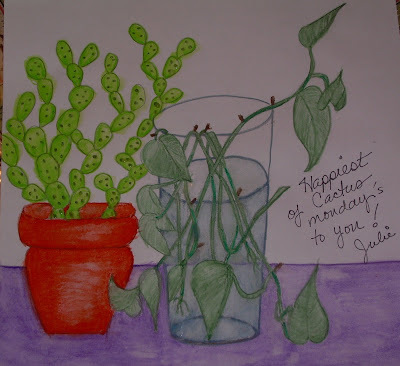 Happiest of Cactus Mondays to YOU! Today I made a decision. It was a big one. It was a decision NOT to have a diningroom table anymore! We never use ours, and I had set up a space in my bedroom for crafty stuff, but I felt so squeezed in there that I rarely wanted to go in. The room that the diningroom table was in is in our Florida room which is surrounded by windows overlooking the backyard (a place I loving refer to an "The Campground" now)! Sunshine comes in, and I have a more open and green view from there. SOOOOO...I moved some furniture around and turned the table into my NEW crafting area, and I am so happy now. Plus I can sit out where the husband and daughter are...out in the house...so I am a happy camper, so to speak now! YEAH!!! This picture I drew and painted with watercolors, which obviously I do not know how to do,... started out by my drawing a glass of pothos that I have rooting on my table. I sort of made up the cactus in my mind to add for this special occasion (Cactus Monday). Hope everyone has a great week coming up. I'm sure gonna try to! 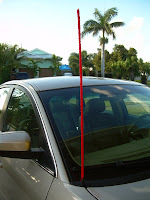 I was inspired to try making a crocheted car antenna cover by Carolie, when she posted this interesting site called KNITTA! I have enjoyed looking at a lot of the pics there...it seems you use knitting to do street art, and it turns into some interesting pieces! I did not knit...I crocheted, and I was using some red yarn at the time, so I decided to sort of just see what I could do...but in the end I just kept going and ended up with this! It is funky and wow...I can never lose my car again in a parking lot!!! Anyway, thanks Carolie for showing me this site!!! :) Hey, I am thinking I may need to do a GATOR one in orange and blue! GO GATORS!!! Thanks for asking, Soulbrush...I have finally scanned and uploaded the new grandkid pics. I have updated the pics into the sidebar with the latest. I may be slightly prejudiced, but I think they are all so gorgeous! Shelby is growing up to be such a handsome young man. The two boys both have such large gorgeous eyes with the longest eyelashes in the universe! The girls just look like little dolls to me...so soft and sweet! I am, indeed, a lucky and very happy Grandma to have them! 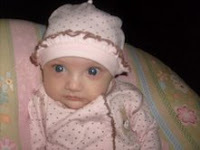 Picture here is the newest little chick...Emily June in Germany...the one I get to go visit in March!!! Looking forward with great anticipation!!! After working 10-12 hour days every day of this week, I decided I would definately set up the tent and make a fire! First we went to dinner with friends, then my friend came down and help me put the tent up. My hubby made a fire, and then we sat around having our beer and singing campfire songs (Just kidding on the song part)!!! It was about 67 degrees out, and not much breeze, so we had no worries with making the fire in the backyard. It smelled wonderful, and made for an enjoyable evening! Doozey, the camp dog, had a great time! Check out the sparks flying through the air! Pretty neat, since we could not see this with our naked eye! 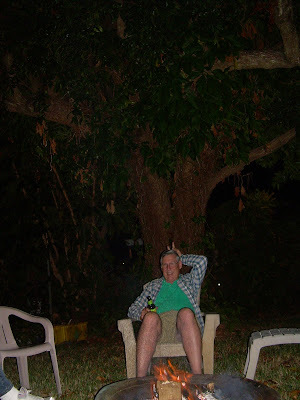 And here is hubby after about 4 beers! 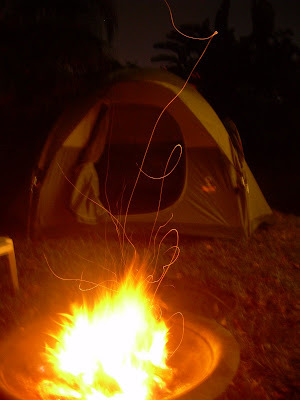 I took a few pics of the wild campsite (backyard) at night! It really is a jungle of sorts! And one wood pile! We have wood just kinda laying around different parts of the yard I suppose for burning purposes...all in different stages of dryness. And last but not least, for those of you that remember me spraying my chairs orange...here they are! They still need a few more coats. I had to stop since my spraying arm and finger were worn out after the first 4 cans!!! They are outdoors to stay. I kinda like them out here, actually! Tomorrow I am going to blow up my queen sized mattress inside the tent, get lots of pillows and blankets out there, eat breakfast outside, and then lay in my tent and crochet some squares for the charity event, with Doozey, of course...go for a nature hike, and then maybe fall back to sleep for an afternoon nap in the lap of tenting luxury!!! LOL! Everyone have a fantastic weekend, OK??? 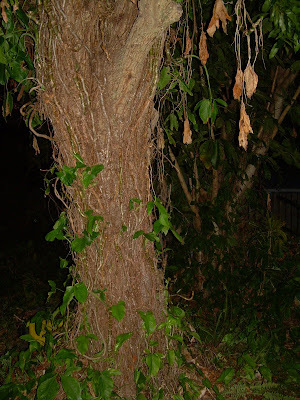 Just a quck note this morning to say hi to all in blogland! 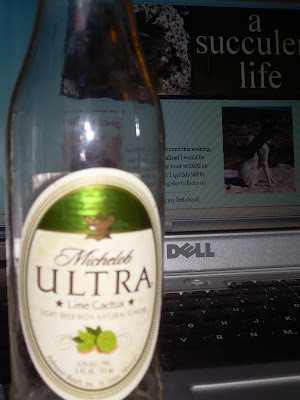 I discovered a new blog which caught my eye due to a cactus post he made, but discovered he loves books and reading, and he has also posted about some reading challenges (you have to visit his links to find out specifics on them)...but they sound so interesting! Do I have time to read much??? I don't know. 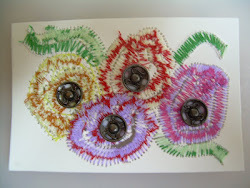 He also has a link to a knitting (or other handicraft) challenge on his blog. I just thought I would tell you about him...he is in UK...Rambles From My Chair. Work is so busy I am about to lose my mind. It is usually temporary, and should calm back down in a week or two. I pray. LOL. Not much new to tell or show around here. Am looking at possibly getting out of town for the weekend for an adventure. A nice nature trek sounds good. Either that, or I am seriously thinking of setting up my tent in the backyard and camping out with my firepit, dog, books and laptop, of course. I think it would be a nice way to relax, and it is supposed to be a bit cooler too, so that would make it very enjoyable! I have about 5 Coleman lanterns, lots of firewood, and I could take pictures of it all and post on Sunday night! I like having my own bathrooms at hand for showers and toilets!!! (OK...I know, I am a camping diva). Just a bit of silly fun...but the thoughts of those campfire hotdogs and baked beans is calling my name! I may invite a friend down who also has a tent. Oh, happy Monday...finally back to the regular everyday days of the year post holidays, and if you are like me, you have a lot waiting for you back at work! I decided I had to make a little something for Cactus Monday...stay up late to work on it so I would not go to bed and then have to seemingly get UP even earlier...and this is the thing I came up with! It is a combination of colored Sharpies, and stickers. Nothing great...but a little bit of cactus fun. Gotta keep my Monday light, green, and hopefully not full of sticky things, but maybe I can say that my mind will be as SHARP as a cactus tomorrow, so I can get everything done smoothly and efficiently! And here is my Cutter Bee, which is actually called a Circle Scissor. It has a drawing handle (you see it sticking up here), and I can pull this one out and put in one with a blade for cutting. I haven't tried cutting yet, but I will have to soon. First, I must get a glass cutting board as they suggest using underneath. The drawing of a circle anywhere from 1-6 inches wide is just fantastic with this thing. My daugher told me just today that they found it at Target, which was surprising to me. I don't think I expected them to carry such a wonderous tool, I suppose! Anyway...just wanted to show you, and you can see a picture in the package HERE if you would like to check it out. It tells more about it underneath the picture. Secret love language of birds! I doodled this tonight using my Cutter Bee, 0.5 Micron pen, and a few gel pens for the colored part. The birds were cut out of a Christmas card and then I expanded upon that. I had been staring at this card for weeks, and finally tonight I snatched it down off the entertainment center and took it to my Cutter Bee! I am glad I acted upon my impulse to do a little something with it...I suppose now I will hang it on my art board so I can at least look at it for a while. I am in a bird phase right now, and seem to appreciate anything having to do with them! 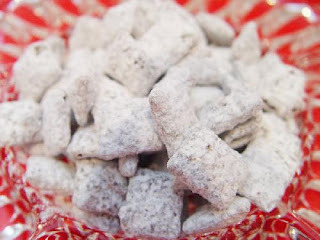 I'm addicted to Puppy Chow! Something new for the start of the New Year! My Mom, my friend and I are making crocheted or knitted squares for Warm Up America.org. We drop off our completed squares to our local Michaels Craft store and a group of people hook all of them together to make afghans for our local VA Hospital. I'm not sure if all Michaels are doing it across the nation, but there is an address at their website where you can mail completed stuff to. The afghans go to all kinds of charities. It has been fun for me during my last 4 days off. I kinda vowed to make 1 square each day I was off, and I was doing fine....as long as I was crocheting. Then I got the big idea to try knitting. Ha! I have about 8 rows done and it is so slow for me, compared to crochet! Here is a pic of my completed 3 crocheted squares, plus one of Mom's (same color), and the start of my 1 knitted one...which I am thinking I will end and finish off both ends with crochet anyway! 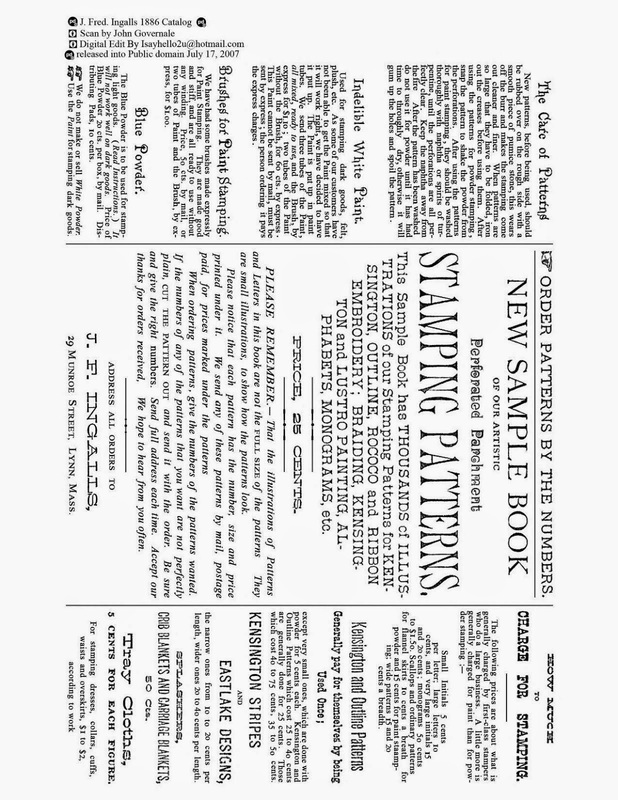 So much for the big knitting experiment!!! LOL. Please don't look at the wrinkled sheet...I had laid it out to build a puzzle on tonight, and we never ended up doing it! Back to the closet it goes!